Our new Orka Prestige Villa is a fantastic new 4 bedroom model with a full glass front and infinity swimming pool. Internally all the living area is on the middle level with two bedrooms on the top and another 2 in lower level. Alternatively you can have an office or gymnasium in one of the rooms. The main living area is open plan with patio windows looking out over the gardens and swimming pool and towards the Ovacik valley. 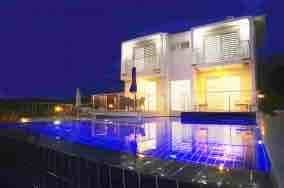 The villa is equipped to a very high specification with all bedrooms being en-suite and a fully fitted modern kitchen. Each bedroom has its own terrace and there is ample patio area around the pool for sunbathing. The villa can comfortably sleep 8 people. These villas are built to order and this is a sample of what your villa could look like.